KOSTANAY (KazInform) – Yesterday a memorandum on mutual cooperation in the implementation of social projects has been signed between the Eurasian Group (ERG) and Kazakh Kostanay region’s administration. The document was inked by Mayor of Kostanay region Nuraly Saduakasov and Chairman of the Board of LLP Eurasia Group, Aldiyar Kaztayev. According to the press service of the ERG, this year the Eurasian Group intends to allocate KZT800 mln ($4.3 mln) for social development and improvement of Kostanay region. It was also noted that in 2012-2014 the company devoted more than KZT2.7 bln ( $10.8 mln) for the same purpose. A number of priority economic, social and cultural projects will be implemented in the framework of the memorandum. 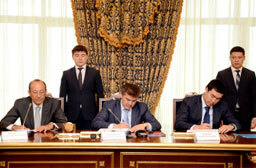 Projects funding will be done through the corporate foundation ERG Komek, JSC SSGPO and JSC Kazakhstan Aluminum. The most important infrastructure projects include the construction of a residential building in Rudny town, repair work of the penstock tunnel going from Sokolovskaya pumping station to Vasilevsky evaporator, reparation of the House of Culture in Oktabrsky village. A significant amount will be directed to the development in the region of hockey, football, volleyball and judo. Besides, there will be purchased rehabilitation equipment for children with cerebral palsy disease, an ambulance car for Rudny ambulance station and skill acquisition equipment for Rudny specialized colleges and institutes. ERG Chairman of the Board of Directors Alexander Mashkevich, who also took part in the signing ceremony, stressed that the Eurasian Group annually finances the most significant socio-economic projects in four regions of the country. Eurasian Group is one third of mining and metallurgy sector of t Kazakhstan, one of the leaders of the State Program of Forced Industrial-Innovative Development. During the first five-year industrial plan of SP FIID Eurasian Group implemented 12 investment projects of a total value of approximately $2 bln. It employs some 65,000 metallurgists, miners, energy workers and transport workers in CIS.